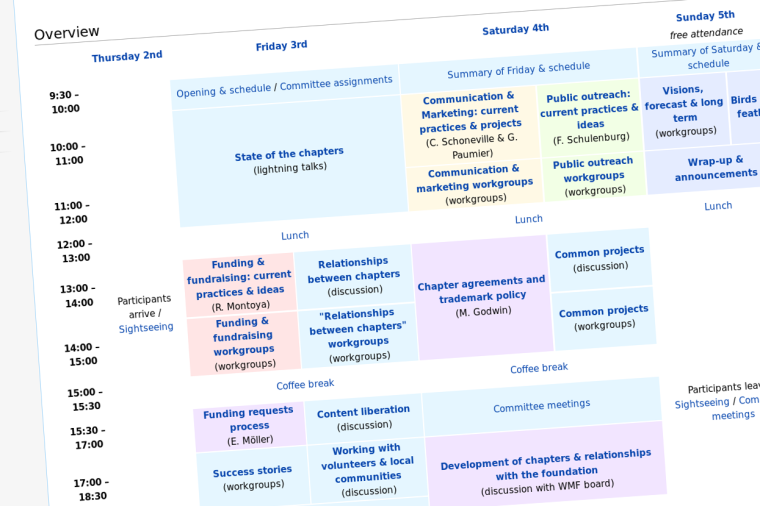 After much thought about various feedback from many people, I am happy to propose a revised version of the schedule for the chapters track of the April 2009 Wikimedia Conference in Berlin. I hope it addresses most of the concerns raised, while keeping the advantages. The revised version of the schedule is available on Meta-Wiki. A detailed rationale / FAQ follows. Most of the chapters will send two representatives; there will be around 50 participants overall. One of the reasons why it was decided to invite two representatives per chapter is that it would allow for more topics to be discussed. It would be a waste of time and money to remove all parallel sessions now that all these people are flying to Berlin. In the revised schedule, three (out of three) staff members will still participate to whole 2-hour workshops that are not simultaneous any more. Moreover, the staff members will be part of appropriate committees that will meet several times during the meeting (see What are these "committees"? below). I believe that what they will bring to and learn from the meeting is undeniably worth their attendance, as much for the chapters as for the foundation. Some chapters expressed concerns about the fact that the WMF staff would come to "teach the chapters how to work". This is clearly not the goal. This meeting is a chance to learn from each other. The WMF offered to send a few people to help with specific topics. If the aim had been to hold courses, we could have just hired a few German experts in fundraising or outreach. Instead, we invited a few members of the staff of the WMF. Not only are they experts in their field, but they already have the experience of the Wikimedia universe. Last but not least, it is also an opportunity for the chapters to show all the good stuff they're doing, and for the staff to learn from the chapters. Where did the morning coffee breaks go? The first schedule had coffee breaks both in the morning and in the afternoon, whereas the revised schedule only shows coffee breaks in the afternoon. Don't worry, we'll have coffee breaks in the morning too :) but they'll be shorter, and adding them to the table was overly complicated. Where did the workgroups sharing sessions go? The workgroups sharing sessions were supposed to be plenary sessions where the various workgroups would present their results. We had to remove them from the schedule in order to free some slots. However, all the workgroups sessions are followed by breaks that allow for informal discussions between participants: lunch, coffee break, dinner, etc. I hope that the workgroups will take advantage of these breaks to share the outcome of their discussions. Besides, all the sessions will be thoroughly documented in order to provide all the participants with a full report of the meeting. Most of the discussions won't be confidential, so the report will probably even be publicly available on meta. The committees are an opportunity to hold discussions in small persistent groups on specific topics. Committees will meet several times during the meeting at pre-arranged or other times. They may continue after the meeting if their assignment wasn't completed. Topics may include: preparing the next fundraiser, discussing trademarks, etc. See also the page on meta-wiki dedicated to Committees.